Sandra had started on a card for a Paper Smooches challenge a few days ago, but was having trouble finding the time to finish it. The deadline for the challenge is tonight at midnight. I am setting up this post in anticipation of her sending me the completed card. Sandra knows me well enough to know that my ability to do just about anything after 8 PM is limited, so the card should be coming any minute now. Paper Smooches Zoo Crew Stamp Set. Posted on October 17, 2015, in Card Samples, Challenge Entries, Felix (Sandra's) Card Samples, Sandra's Challenge Entries, Uncategorized and tagged Copics challenges, Paper Smooches. Bookmark the permalink. 1 Comment. Too fun! 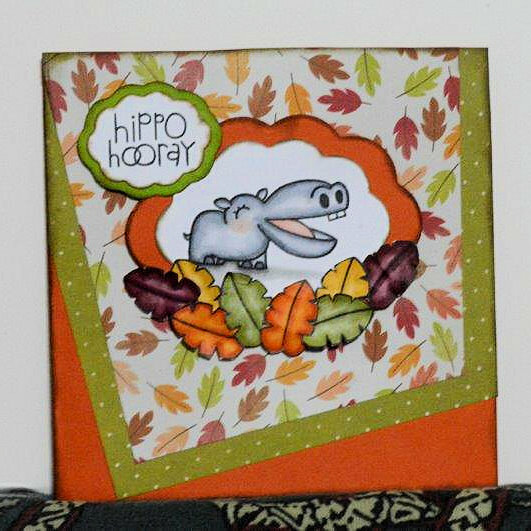 Love how you framed the hippo image. Thanks for joining us at Paper Smooches SPARKS!